Located on the border of Corona and Riverside, our TO&A Deposition Services center offers our court reporting clients close access to freeways 91, 15 and 215. 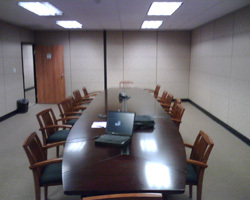 Providing a professional and functional environment, this center features a well-appointed reception area, furnished offices, and three equipped meeting rooms. Our experienced administrative staff is happy to assist you, and we are committed to providing our clients with memorable service and quality care.